Most of us remember the lyrics of this popular song from the late 60’s. When it’s the dock at ‘Tween Waters Inn there is a lot to see just sitting quietly on the dock near the bay. The best vantage we found sits high on the upper level observatory deck on the dock at the resort’s Marina. It’s a big bench so you can sit with a friend. Bring light refreshments and you can sit there as long as you like. The view is an expanse of breathtaking back bay waterway framed by sky and landscape as far as the eye can see from Captiva Island. The sun rises over the bay taking center stage, travels over head, and sets behind on the nearby Gulf of Mexico beach at the very end of the day. Close your eyes and the sounds are pure and natural, aside from a boat motor softly going by from here and there. The wind, the birds, the sunshine and much more can be heard and felt without seeing anything. When you open your eyes and you’ll find the view on of the bay is colorful, peaceful, reflective and grand. The sights from the dock on the ‘Tween Waters bay are always right there for guests to enjoy. While this bench may not be as popular as the pool, restaurants, bar or beach it offers the bay gazer all that a nature lover on a Southwest Florida island could ever ask. 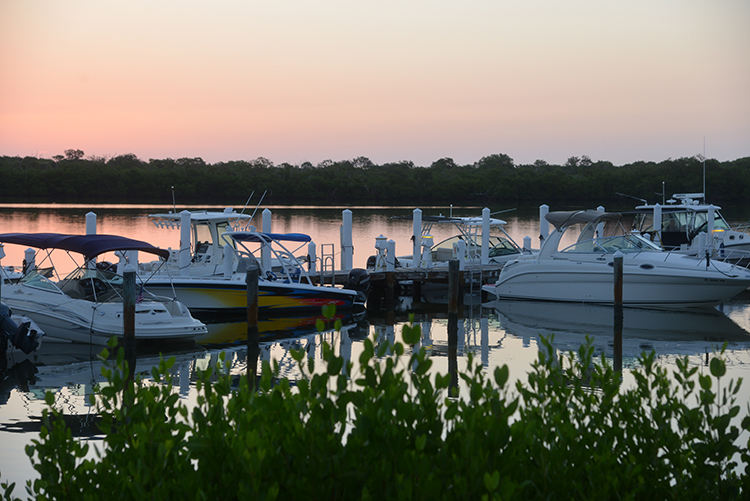 This is the perfect place to start or end your day while you visit ‘Tween Waters Inn. It’s where you can go to relax after lunch, before or after a special outing or a trip to the Spa. The ‘Tween Waters dock on the bay is a place to reward your senses or to day dream. The area underside of the upper deck is perfect for yoga or meditation… during the most quiet times of the day. We visited first thing in the morning. My husband, Eric and I were all by ourselves until the fisherman woke up. From up top, the spot is perfect for conversation or silence. It offers another tropical paradise memory you will remember about your visit to the resort. Most importantly, it’s there for you to enjoy!